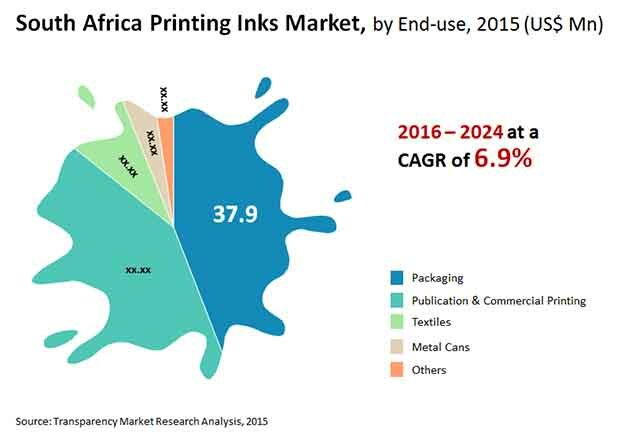 The highly fragmented printing inks market in South Africa is dominated by the top six companies, which cumulatively accounted for more than 60% of the market in 2015. These companies are New Africa Inks (Pty) Limited, Constantia Printing Inks, Hi-Tech Inks (Pty) Ltd., Flint Group South Africa Ltd., Hostmann-Steinberg South Africa (Pty) Ltd., and NUtec Digital Ink (Pty) Ltd. While the dominance of these companies could continue unchecked in the South Africa printing inks market, Transparency Market Research also predicts the increasing penetration of multinational printing inks industry players to create stiff competition for domestic players in the South Africa printing inks market. Despite the collective dominance of the six leaders, the market lacks a clear leader and existing players are constantly having to develop new products to expand their consumer base and keep ahead of the competition. For instance, in August 2016, Flint Group Flexible Packaging launched VarioLam AB LEC. This range of multi-functional polyurethane-based (PU-based) inks is claimed to deliver supreme protection from moisture, heat, and pressure. As a result, it provides significant benefits such as extended shelf life. Such product developments are integral to the growth prospects of the South Africa printing inks market. The South Africa printing inks market was valued at US$85.9 mn in 2015 and is estimated to reach US$155.1 mn by 2024, expanding at a CAGR of 6.9% therein. The segment of offset printing inks held the dominant share in the South Africa printing inks market in 2015, accounting for over 40.0%. Offset printing inks are anticipated to remain the leading product segment of the printing inks market in South Africa in the coming years. The digital printing inks segment, on the other hand, is projected to witness sustained growth in the South Africa printing inks market during the forecast period, with an 8.6% CAGR expected from 2016 to 2024. The packaging sector is the leading end user of printing inks in the South Africa market and is estimated to hold a share of close to 50% in the South Africa printing inks market by the end of 2024. At a projected CAGR of 7.3% over the forecast period, the packaging industry is likely to also emerge as the most rapidly expanding end-use segment of the South Africa printing inks market in the 2016-2024 forecast period. The publication and commercial printing industry is also a prominent consumer of printing inks in the South Africa market and is projected to present several opportunities for growth of the latter. The packaging industry in South Africa has received a major impetus thanks to the recent surge in the country’s GDP and the subsequent increase in individual disposable incomes, the continuously changing lifestyles of the consumers, and the country’s growing youth population. Any growth in the demand for packaged consumer goods has a positive impact on the South Africa printing inks market. The rising use of online shopping portals is thus another key driver for the South Africa printing inks market. “Various types of printing inks and varnishes are used on a wide range of substrates and surfaces to develop the resistance of packaging materials,” a TMR analyst notes. Flexographic and gravure printing inks, for instance, are used extensively on flexible and moldable materials. Low migration inks and water-based inks, on the other hand, are highly popular in the food packaging industry, as they don’t cause any serious side effects. Hence, the strengthening consumer goods industry in South Africa is likely to remain a key driver for the South Africa printing inks market in the coming years. The demand for E-commerce is growing at a significant pace across the globe. This has resulted in a substantial decrease in the use of paper-based communication channels, obstructing the growth of the conventional publication and commercial printing industry to some extent. The South Africa printing inks market thus faces a considerable threat from the rapid rise in the popularity of digital media. Nevertheless, the rise of digital media could also be turned into an opportunity for the South Africa printing inks market, as it is likely to drive the demand for digital printing inks. Digital printing is commonly used in textiles, fine arts, advertising, desktop publishing, and architectural designs and is preferred over traditional printing as it offers flexibility of operation and speed. This could be a significant opportunity for the South Africa printing inks market to adapt to its changing business environment and stay one step ahead of the challenge.